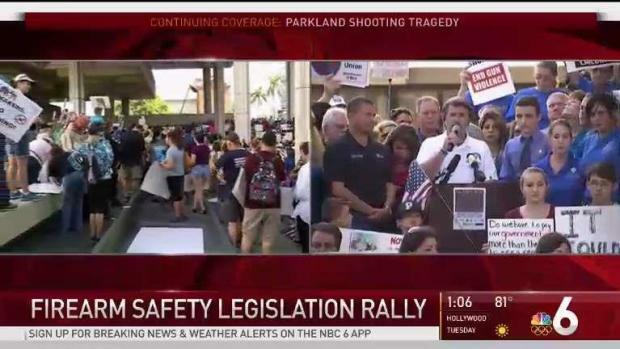 NBC 6 Reporter Amanda Plasencia is in Ft. Lauderdale where thousands gathered in Ft. Lauderdale to call for stricter gun control legislation. Survivors of the shooting that killed 17 people spoke with passion during Saturday's rally in front of the federal courthouse, and pleaded with lawmakers to change the nation's gun laws. One student, Emma Gonzalez, angrily criticized politicians who take campaign contributions from the National Rifle Association. She challenged them to stop taking money, leading the crowd in a call-and-response chant. "They say a good guy with a gun stops a bad guy with a gun," she said, chanting with the crowd, "We call BS." She also said adults who believed that the shooter was mentally ill should have done more to prevent him from having a weapon. A mosaic of public records is reported to show that alleged gunman Nikolas Cruz was dealing with depression and harming himself. When a Department of Children and Families investigation concluded in November, officials deemed him "stable enough not to be hospitalized." People also reported Cruz to law enforcement officials, including a person who warned of his "desire to kill people, erratic behavior, and disturbing social media posts," but the tips fell through the system's cracks. It was after these reports that Cruz allegedly used a legally purchased semiautomatic rifle to attack his former school on Wednesday. At the rally, senior Delaney Tarr took on a lack of gun legislation, saying, "People that I know, people that I love have died, and I will never be able to see them again." "They will never be able to attend homecoming, to attend prom, to go to college, to receive those national meritts scholarships, to school on their school's swim team. I just want to know, where's the common sense in that," Tarr said. One victim, Nicholas Dworet, had committed to swim for the University of Indianapolis. Another victim, Carmen Schentrup, was named one of 53 National Merit Scholarship Program semifinalists in September. 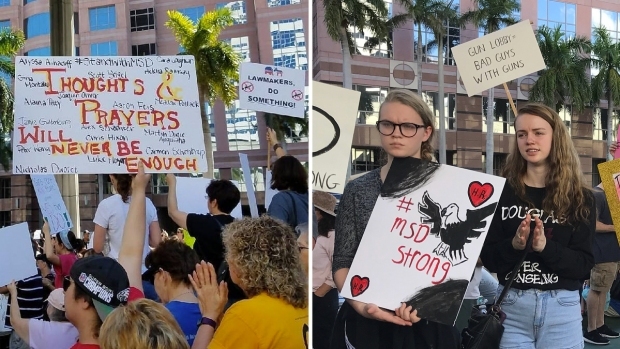 Students and faculty of Marjory Stoneman Douglas High School passionately spoke out at a gun control rally in Fort Lauderdale, Florida, three days after an alleged gunman opened fire and killed 14 students and three school staffs. Florida Sen. Gary Farmer of District 34 took the podium Saturday and said that "the discussion of sensible gun safety laws has been absent and silenced in Tallahassee and in Washington D.C. for too long." “This is the result of the stranglehold that the NRA has over Tallahassee and Washington DC and too many legislators,” he continued. One parent, Kiara Finn of Miramar, told NBC 6 that her 5-year-old daughter Tarin asked if the gunman was coming to her school, and "if anybody can just come into her school and shoot them." Finn said her message to legislators is "enough is enough," and that there is no reason for an assault rifle. The Florida Gun Shows organizers say they want to acknowledge the City of Parkland and its citizens, as well as the students and teachers who were murdered in the vicious attack. "There’s no disrespect or insensitivity intended by this long-planned gun show,” the organization said. "We demand and enforce strict gun safety and encourage training for those who wish to own firearms." In addition to Saturday's rally, the mass shooting sparked calls for more protests, walkouts and sit-ins across the United States. 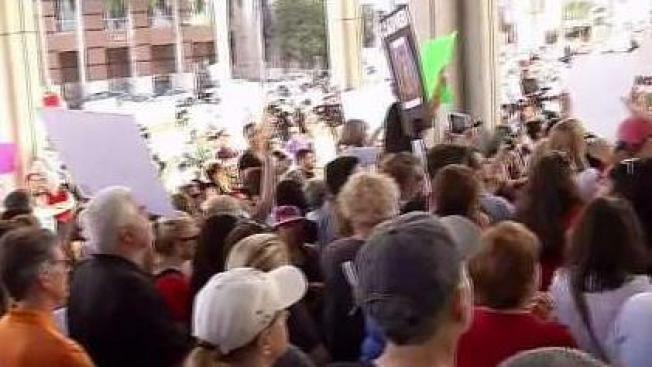 Chanting "enough is enough" and waving signs emblazoned with messages like "No more silence, end gun violence," hundreds of demonstrators gathered outside the Federal Courthouse in Fort Lauderdale Saturday to rally for stronger gun control laws. The Associated Press' Sudhin S. Thanawala contributed to this report.